Please give us a broad overview of your Digital Labs already deployed in the institutes. We started moving into the schools only last year, February 2014 to be precise. In last one year, we have trained more than 10,000 students. We have also signed 25 schools in Bangalore, Kerala and Delhi with 70% of the schools using our product as an integrated program in the schools. With the kind of response that we have got from the schools, this year we feel that we would at least double the number of schools and the students. Tell us about your top selling Digital Lab product. As of now, we have only one product “Bibox Innovation Lab”. The entire session is an hour and 20 minutes long. 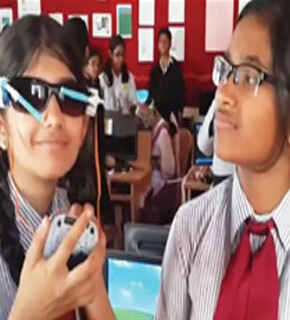 Every time the students come into the class, they are exposed to a challenge and by the end of it, they are expected to create the prototype with automation, art and craft etc. The price depends upon school to school and the number of students. Since the entire solution is a service model, the entire material, two mentors (all engineering graduates), tablets which are being used by the kids are a part of the program. Depending on the number of students, our rates vary from 2500/- per annum to 6000/- per annum for a child who attends a BIBOX class. What kind of systems are parts of the Digital Lab product package that get delivered to the institute for setting up of a digital classroom? Everything that goes into the school is our propriety and the school only pays per child. Please tell us about the new Digital Labs you are planning to develop in the future. Our endeavour is to develop the futuristic products, which is exposed to kids already familiar with the technology and blend with his overall learning. We keep investing into creating newer technology so that these children are able to bring out innovation and make these children ready for the next gen skill sets. What is the market size of the Digital Labs business in India? We are unique at this point of time and the solutions are absolutely new. There is no competition as such and hence we stand a good chance to penetrate into the market very well. Proof of the pudding is also to see the enthusiasm in all the schools wherein we had signed up last year. What kind of growth did your business see in 2014? What growth rates are you aiming for in 2015? Though, we do not want to disclose our revenues at the moment, our growth next year would ensure that we would earn at least 50-80% more revenue than last year. Are the digital Labs cheaper than the traditional teaching tools? How has the system of Digital Labs impacted on pedagogy? In fact in our case, more than the gadget, it is the pedagogy which has made the entire program successful and popular. In our classroom, we divide the children into a group of three, wherein each one of them would have a role viz. Concept Leader, Assembly and Logic guys. Concept leader would lead the team for that day and the responsibility would keep rotating. An assembly guy would create the art and craft for the project and the logic fellow would do the programming. Our programme is based upon the 21st century learning skills and focusses on the 4 “C”s and the STEAM (Science Technology Engineering Arts and Maths concepts). The overall program is based on the Design Platform and the Challenged Based Learning.